On Aunt Mildred's Porch: A Beehive of Activity! On Saturday mornings, the barn is a totally different place than at any other time of the week. Most afternoons, there are lessons or kids camp, but there isn't a lot of adult activity. 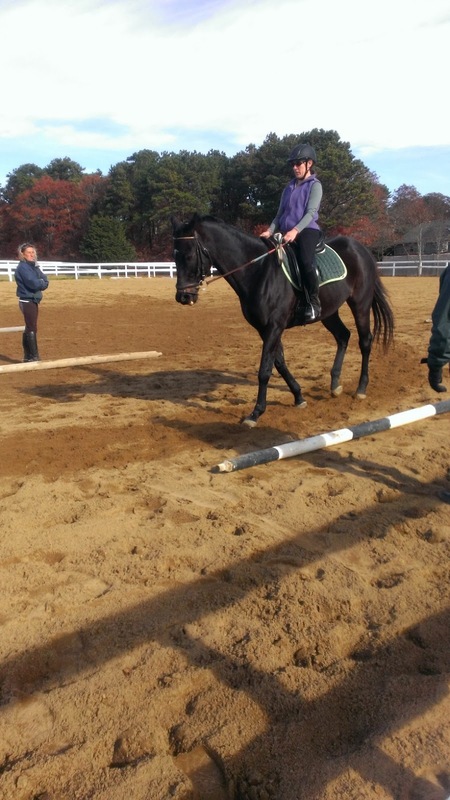 I'm often the only one in the ring at the time I ride. The Saturday activity started with a Women's Horsemanship class that she started offering to women who wanted to learn more about horses and riding, or who have a horse but want some company while riding. Jackson wasn't available for riding on Saturdays, so I never bothered to go to the barn. It never occurred to me that I could ride someone else. Danny has turned into a better horse for riding, so I've ridden him when no one else was available. And there's always Tucker, but that's like oil and water, so it's not my first choice. He spends most of my ride telling me that he's in charge while I'm trying to tell him I'm in charge and it's a lot more aggravation than I want to put up with. 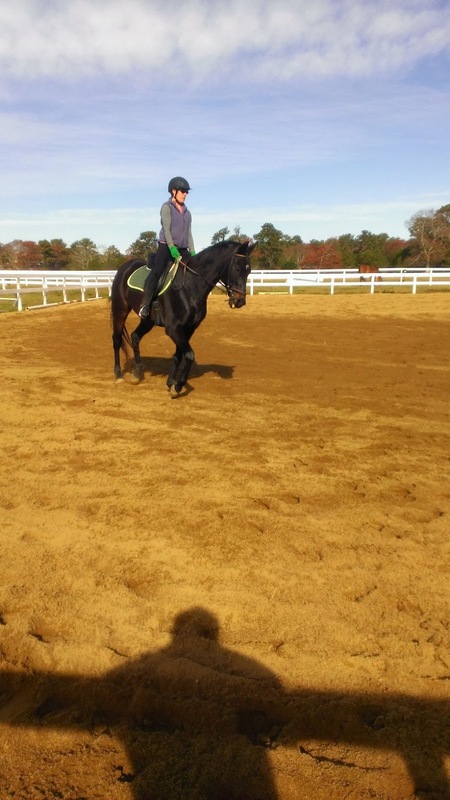 Once Jackson became available on Saturdays, I started riding him without a lesson, trying out some things on my own and making decisions without her telling me every single move to make. It's great and Jackson is being really good with me. We had a 6 week break when he was lame with a tendon issue, but he seems to be back and sound and raring to go. And some days, I do mean raring. A few days, I have spent my entire lesson just trying to channel his energy into what I'm asking him to do but he's pretty sure he just needs to go super fast at all times. Today, I finished my ride by going out into the big field and cantering around. I've always just done it in the ring, and usually in circles because it's how you have the most control. The field is pretty big, so he thought going pretty fast would be a really good idea. It was different and kind of fun, but a little scary because by the 3rd time, he was pretty quick. Something about the open space just gets him all frisky. What I didn't realize is how much fun it is when there are lots of people around. Lots of horses being used. Lots of coming and going. And people talking. That hasn't really happened at any other barn we've been to. Even in the frigid cold, there are have been a few people riding on Saturdays, but today, we have a heat wave of 40 degrees, so it was just bustling with activity. There are 2 new horses (didn't get a picture and they aren't for everyone to ride), so the horses themselves were excited about new horses to play with. There were women riding, kids riding, kids playing with dogs, people cleaning, snow thawing and sun shining. I go with the intention of just riding and getting on with my Saturday to do errands and catch up on things and then a few hours goes by and half the day is over already! It's what riding should be all about but this is all new for me because I've spent so much time being the only one having a lesson and being under close supervision at all times. Allowing me to ride like this is totally allowing me to figure out some things and finally feeling what I'm supposed to be feeling because I don't have to listen for her guidance. Then we see do some serious lessons and then I free ride again. It also lets me figure out what I'd do if I really owned a horse since I would be free to ride all the time if it was my own. After so much time being told what to do, it's a little weird to be in charge! I haven't ridden a horse in YEARS. I would love to ride again someday and/or have my kids ride.